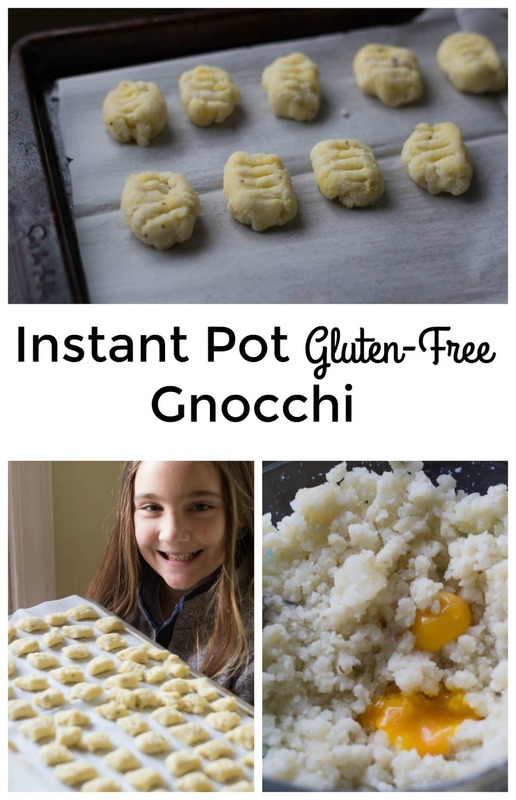 Gluten-free gnocchi!!!  Alright, my friends. 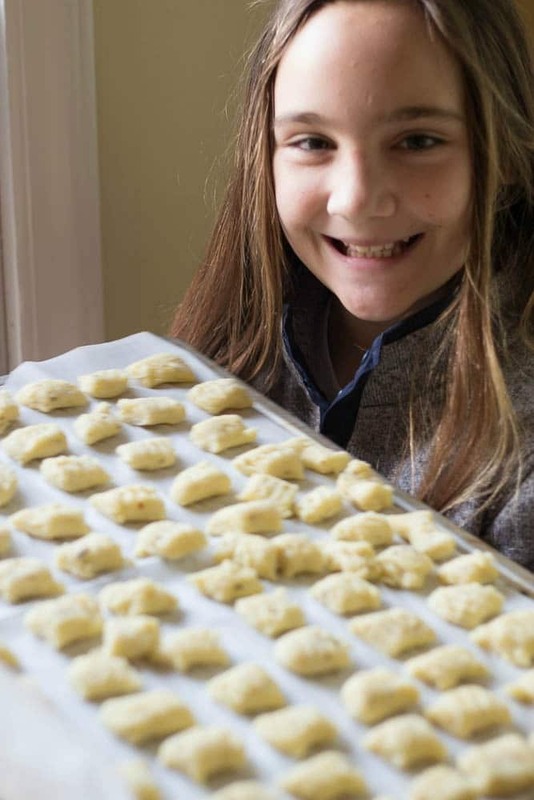 If you are GF, or if you’re not, making your own gnocchi will make you feel like a rockstar. I can’t believe how easy this DIY gluten-free gnocchi was to make at home. And, just to plug my favorite appliance – the Instant Pot – cooking the potatoes in the instant pot was so efficient. Importantly, since we steamed them in the pressure cooker – and didn’t boil them – we didn’t have to worry about extra water in the potatoes making our mixture to mushy. I pierced as many potatoes as would fit in the bottom of my Instant Pot (of course the Instant Pot was involved!). I cooked about 6 potatoes. I added 1 cup of water and cooked the potatoes on manual for 10 minutes and then forgot about them for another 20 minutes or so while I grabbed kids from school. I pulled the skin easily off the cooked potatoes, burning off my fingerprints in the process. Don’t do that. 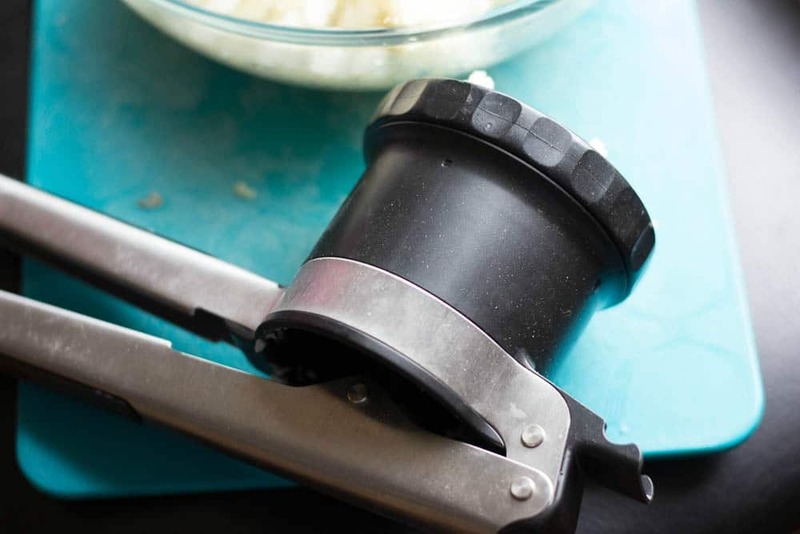 Potato ricer – great kitchen tool! Rice the potatoes! (Do you have a potato ricer? They’re awesome.) 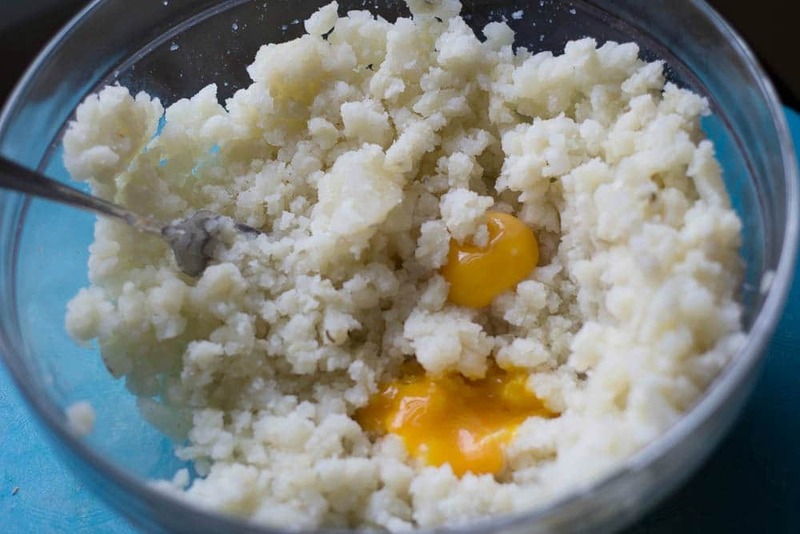 Add 2 egg yolks (or 1) and about 1 cup of flour and some salt to the riced potatoes. Use a wooden spoon to mix the ingredients together until they form a dough. 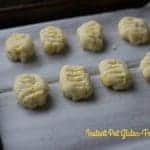 Once you have your potato dough, you can either form tiny little gnocchis individually or make a long roll and cut it into smaller potato puffs of goodness. Freeze for at least an hour on parchment paper on a cookie sheet. Cook your gnocchi in salted boiling water until they rise to the top. Drain immediately. If you wish, sauté your cooked gnocchi in a hot pan with pesto or olive oil and salt and garlic. Enjoy! 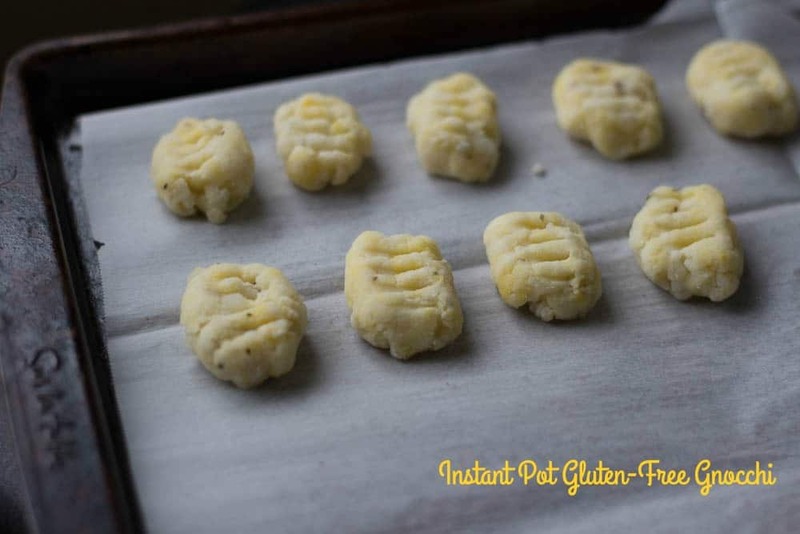 Use your instant pot to help you make this super easy gluten-free gnocchi! Start with the potatoes. About 6 large potatoes fit comfortably in my Instant Pot. I pierced all of them a few times with a fork and I added 1 cup of water. Cook the potatoes on Manual for 10 minutes and then let it natural release for about 15 to 20 minutes. Slide the skins off the potatoes without burning your fingers. Rice the potatoes using a potato ricer, if possible. Add 2 egg yolks and about 1 cup of flour and some salt to the riced potatoes. 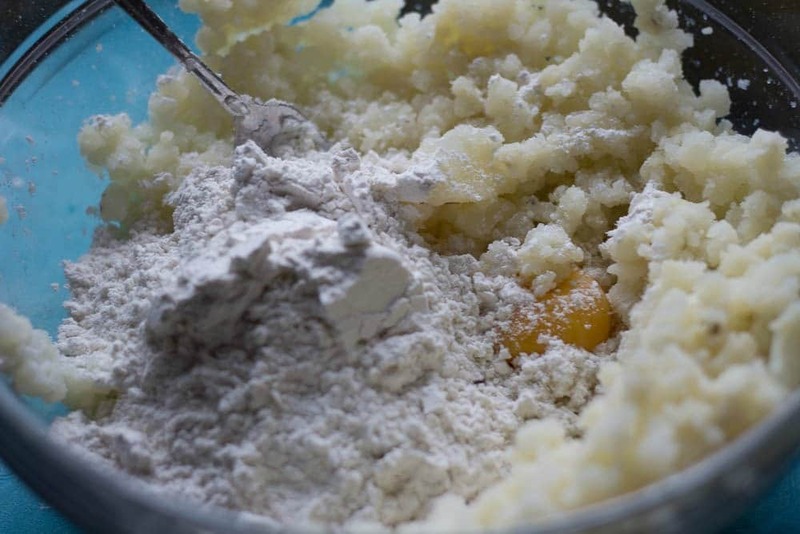 Use a wooden spoon to mix the ingredients together until they form a dough. You can either form tiny little gnocchis individually or make a long roll and cut it into smaller potato puffs of goodness. Mark each gnocchi with a fork. Freeze for at least an hour on parchment paper on a cookie sheet. Cook your frozen gnocchi in salted boiling water until they rise to the top. Drain immediately. Serve immediately OR toss with olive oil or pesto in a hot pan and cook for a few minutes. Looks fantastic!! Never thought of the Insta Pot for potatoes. This looks great! Love how you used the Instant Pot and made them gluten-free! Thanks so much, Carol! Love my Instant Pot!